What Is the Largest Buddha Statue in Asia? The image of the Buddha is one of the world's most familiar icons, representing wisdom and compassion. From time to time, people have been moved to erect really big Buddhas. Some of these are some of the largest statues in the world. Which of the giant Buddhas of Asia is the biggest? A ranking is complicated when trying to account for seated, standing, and reclining variations. The list of biggest Buddha statues is ever-changing—a fact that is in keeping with the Buddhist belief in non-permanence of all things. The Spring Temple Buddha erected in Lushan, Henan, China is 420 feet tall, but changes to the pedestal will make it stand even taller when completed. In Guifeng, China, stonemasons are working on a reclining Buddha statue that will be 1,365 feet long. There is some mystery surrounding this statue and whether it has been completed as designed. There are plans to build a 500-foot bronze seated Maitreya Buddha at Kushinagar, Uttar Pradesh in northern India. If completed this will be the largest statue in the world. In the pages that follow, you'll see six of the largest Buddha statues in Asia. For 12 centuries, the giant Buddha of Leshan has gazed benevolently over the Chinese countryside. About the year 713 CE stone workers began to carve the image of Maitreya Buddha out of a cliff face in Sichuan, western China. The work was finished 90 years later, in 803 CE. The giant Buddha sits at the confluence of three rivers--the Dadu, Qingyi, and Min Jiang. According to legend, a monk named Hai Tong decided to erect a Buddha to placate water spirits that were causing boat accidents. Hai Tong begged for 20 years to raise enough money to carve the Buddha. The great Buddha's shoulders are about 92 ft. wide. His fingers are 11 ft. long. The large ears are carved wood. A system of drains within the figure has helped preserve the Buddha from water erosion through the centuries. Maitreya Buddha is named in the Pali Canon as the Buddha to come in the future and is considered the embodiment of all-encompassing love. He often is depicted seated, with his feet planted on the ground in readiness to rise from his seat and appear in the world. At nearly 394 ft. (120 meters) in height, the Ushiku Amida Buddha is among the tallest Buddhas in the world. Ushiku Amida Buddha of Japan is located in Ibaraki Prefecture, about 50 km northeast of Tokyo. The figure of Amida Buddha is 328 ft. (100 meters) tall, and the figure is standing on a base and lotus platform that together measure 20 meters (nearly 65 ft.) tall, for a total of 394 ft. (120 meters). By comparison, the Statue of Liberty in New York is 305 ft. (93 meters) from the bottom of its base to the tip of its torch. The statue's base and lotus platform are made of steel reinforced concrete. 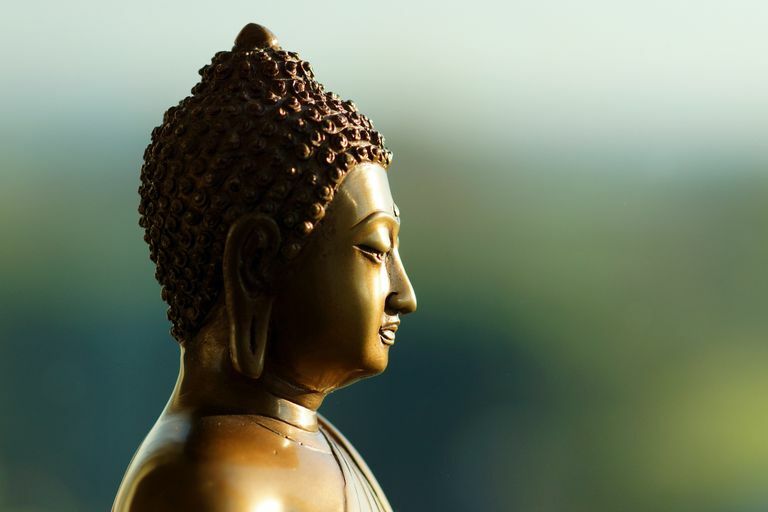 The Buddha's body is made of a "skin" of bronze over a steel framework. The statue weighs more than 4,000 tons and was completed in 1995. Amida Buddha, also called Amitabha Buddha, is the Buddha of Infinite Light. Devotion to Amida is central to Pure Land Buddhism. This reclining Buddha of Burma (Myanmar) was built in 1991. A reclining Buddha, a frequent theme in Buddhist art, signifies the Buddha's parinirvana—his death and entry into nirvana. The reclining Buddha of Monywa is hollow, and people can walk inside its 300-ft. length and view 9,000 small images of the Buddha and his disciples. The Monywa Buddha's status as the largest reclining Buddha may soon end. Currently, a stone reclining Buddha is being carved in east China’s Jiangxi Province. This new Buddha in China will be 1,365 ft. (416 meters) long. Although it is smaller than the seated stone Buddha of Leshan, the Tian Tan Buddha is claimed to be the tallest outdoor seated bronze Buddha in the world. It took nearly 10 years to cast this enormous bronze seated Buddha. The job was completed in 1993, and now the great Tian Tan Buddha raises his hands in benevolence over Lantau Island, in Hong Kong. Visitors may climb 268 steps to reach the platform. The statue is called the "Tian Tan" because its base is a replica of Tian Tan, the Temple of Heaven in Beijing. It is also called the Po Lin Buddha because it is part of the Po Lin Monastery, a Ch'an monastery founded in 1906. Chinese travel agencies claim this colossus of Wuxi, Jiangsu Province, is the world's biggest Buddha, though the measurements say this is an exaggeration. If you count the lotus flower pedestal, the Great Buddha at Lingshan stands just over 328 ft. (100 meters) tall. This makes the statue shorter than the 394-ft.-tall Ushiku Amida Buddha of Japan. But he's an awe-inspiring sight, nonetheless--notice the people standing at his toes. The statue stands in a lovely setting overlooking Lake Taihu. The Great Buddha of Lingshan is bronze and was completed in 1996. Although it is no longer the largest Buddha in Japan, the Nihonji Daibutsu still makes an impression. Carving of the Nihonji Daibutsu (daibutsu means "great Buddha") was completed in 1783. Damaged over the years by earthquakes and the elements, the stone figure was restored in 1969. This daibutsu is carved in a common pose for a Medicine Buddha, with his left hand holding a bowl and his right palm upward. Visualization of the Medicine Buddha is said to be good for mental and physical health. The Buddha is on the grounds of Nihonji Temple in Chiba Prefecture, which is on the eastern coast of Japan near Tokyo. The original temple was established in 725 CE, making it one of the oldest in Japan. It is now run by the Soto Zen sect.